Dr. Shin Hyun-Deok (center), president of Samsung Line Plastic Surgery in Seoul poses with CEO Liang Chen (right) of iface of China, and Mr. Gregory J. Pence, staff writer of The Seoul Times at Seoul Int'l Medical Tourism Congress (SIMTC) held at a Seoul hotel on Sept. 24, 2009. South Korea's renowned doctors and surgeons have their finger on the world's pulse. 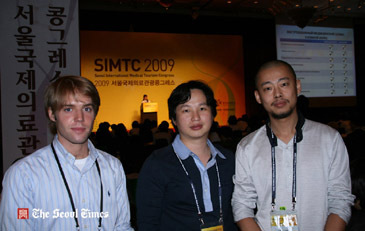 The Seoul International Medical Tourism Congress (SIMTC) met on Sept. 24, 2009 at the Millennium Seoul Hilton to promote international medical tourism. Sponsored by The Financial News and the Korea National Tourism Organization (KNTO), the SIMTC reflected on medical tourism's expanding infrastructure in Korea, discussed better business practices, and created connections with hospitals across the globe, including India, China, the United States, and Russia. Korea's international medical tourism is booming, with a 30 percent increase in overseas patients despite the ongoing global recession and the H1N1 influenza. Playing no small part in the business' growth is the Ministry of Public Health and Welfare, and the Ministry of Culture, Sports, and Tourism, as the government seeks to cater to the needs of uninsured and underinsured patients. 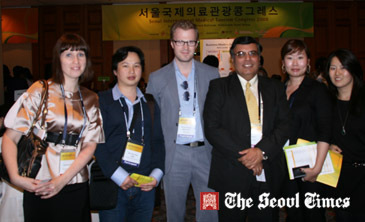 Dr. Shin Hyun-Deok (2nd from left), president of Samsung Line Plastic Surgery in Seoul poses with other representatives and agents of medical toursim at Seoul Int'l Medical Tourism Congress (SIMTC) held at a Seoul hotel on Sept. 24, 2009. To his right is Mr. Benjamin Howes, manager of Jaseng Hospital. Second from right Ms. Song Mina, senior of Jasen. At extreme left is Ms. Gorshunova Olga, manager of medical tourism Valdivostok Office of Korea Sparkling. This year the ROK hopes to meet the goal of 50,000 medical tourists, representing 250 billion won in revenue. To address the concerns of foreign clientele, most notably reservations about quality of care and hospital reputation, Korea's doctors presented lectures on recent innovations in medicine. The new Diabetes phone proves as effective as internet-based glucose monitoring systems in glucose control for a short-term period. Proton Beam Therapy (PBT), offered at the National Cancer Center, is a painless, non-invasive treatment for early-stage cancers. Dr. Kun-Ho Yoon of The Catholic Institute of ubiquitous Healthcare presented U-healthcare, a cost-efficient system which incorporates advanced telecommunication and provides patients with a multidisciplinary care team. Nevertheless, medical tourists from developed nations sometimes discriminate against Korean doctors. One anonymous Korean plastic surgeon remarked, "[The patients] thinks their system at home is better, oftentimes making the erroneous assumption that my education at Seoul National University — Korea's premier medical program- is akin to a correspondence course." Interestingly, the patients who discriminate against the surgeon oftentimes still undergo the procedure after they state their opinions. Simply put, health care is less expensive in Korea. In the USA, a heart bypass costs $130,000. The same procedure costs $34,150 in Korea. According to Dr. Young-Kwon Cho, the publisher of The Financial Times, "We believe that Korea will emerge as a global health care center blessed with advanced medical science and facilities, top-quality IT and strong government support." He finished, "This Congress will serve as a major stepping stone for Korea to become a leader in the global health care industry." Gregory J. Pence serves as Associate Editor & Art Director for The Seoul Times. He graduated from Dartmouth College in 2006, majoring in Government. He also studied international relations at the London School of Economics in England. Many respected publications distributed his cartoons, including The Dartmouth and The Dartmouth Free Press. To view additional cartoons, visit www.toonouttheworld.com.